Did you make a ham on Christmas? If so, you probably have some leftovers in your freezer. I love having ham leftovers. There are so many things you can do with leftover ham. Today I'm sharing with you an awesome one-pot dinner using cooked ham. 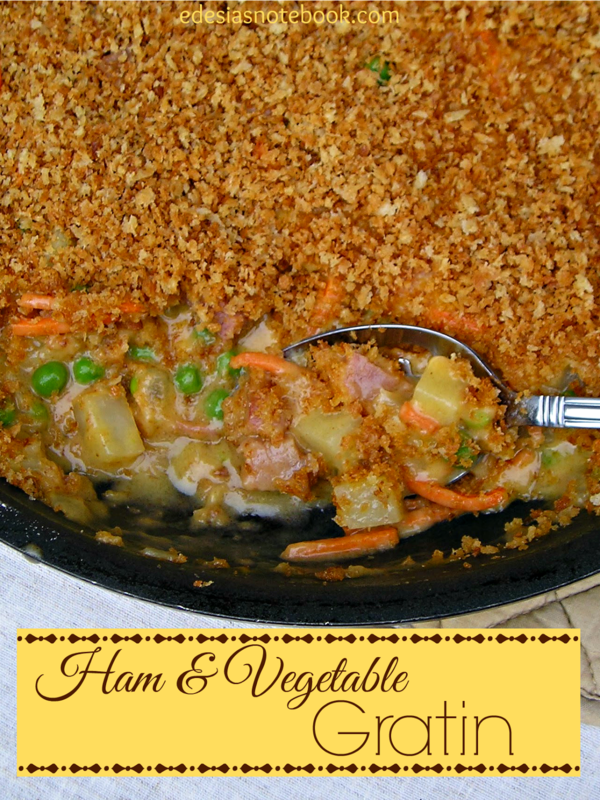 Ham and four different veggies in a velvety cheesy sauce and topped with crunchy breadcrumbs. I found it in Food Network Magazine and changed it up a bit. Here's how I make it. Preheat the oven to 375 degrees°. Heat 2 tbsp olive oil in a large ovenproof skillet over medium-high heat. Add the onion, potatoes, carrots, and peas and cook, stirring occasionally, until the vegetables begin to soften, about 5 minutes. Add the ham, flour, garlic powder, paprika, and salt and cook, stirring, until combined. Stir in the chicken broth and bring to a boil, then stir in the milk and simmer until slightly thickened, about 3 minutes. Stir in the cheddar cheese. Transfer the skillet to the oven and bake until the potatoes are tender, about 20 minutes. Meanwhile, heat the remaining 3 tbsp olive oil in a medium skillet over medium-high heat. Add the panko and cook, stirring constantly, until the panko is slightly toasted, about 4 minutes. Scatter over the ham and vegetable mixture; let rest 5 minutes before serving. Isn't it beautiful with those perfect golden brown crumbs on top? This dish is so yummy! It's kind of like a pot pie, but with a crunchy topping instead of pastry. The sauce is so flavorful with the garlic and paprika. You can leave out the cheese to make this a little healthier, but I'm all about the comfort foods this time of year. This is definitely comfort food; perfect for a cold January day. Now, I'm categorizing this as a one-pot meal, even though technically the recipe has you toasting the panko in a separate pan. If you really want to only wash one pan, then toast the panko first, remove it to a bowl or plate, and proceed with the rest of the recipe. The only difference is that the breadcrumbs won't be hot when you serve it, but that should be ok because the filling will be hot enough to warm them up when you put them on top. This is so good that if you don't have any ham leftovers, you need to go to the store and buy some ham just for this!